How Close Should You Try to Get to a Rising Trout? 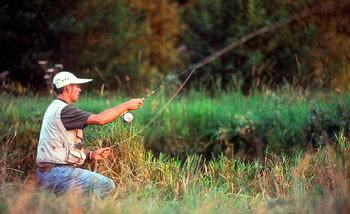 Question: How close should you try to get to a rising trout before casting to it? If there are several conflicting currents between you and the fish, it pays to try to sneak close—ideally close enough to use the length of your rod to hold the line out of the conflicting currents. Otherwise, all those currents will drag on your line and ruin your dead drift. If you’re casting downstream to a fish, you have to stay farther away, since the fish is facing you; an upstream approach (from behind the trout) allows you to get closer. This is one reason that most dry-fly anglers prefer to fish upstream. The shorter the cast, the more likely it will be accurate, and the less line on the water, the more likely you are to achieve a good dead drift. Just because you can cast 40 feet doesn’t mean you have to. You’ll catch more fish if sneak closer. Keep a low profile, and dress for stealth. Wear earth tones and don’t hang your silver hemostat high on your vest. Once you are close to a fish, don’t start flailing away immediately. Take the time to plan your casts and drifts carefully. The closer you are to a fish, the fewer casts you want to make.